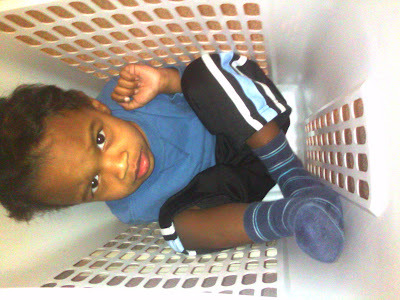 William in a laundry basket~ He said "Help! I stuck"
Haha. Is he in the hamper? I can't tell, but he's so cute. Oh wait, just read the caption. LOL. "Reading is fundamental, Alicia* So funny that he cried for help. LOL. LOL!!!! He really got himself into a pickle this time. So cute!!! LOL how cute. They love laundry baskets.